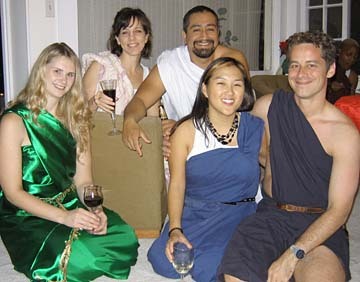 TOGA TIME: Candice McGuire, left, entertained Aimee Harris, Oscar Salgado, Janell Smith and Andrew Laurence at her pre-Valentine's Day toga party Saturday in Manoa. 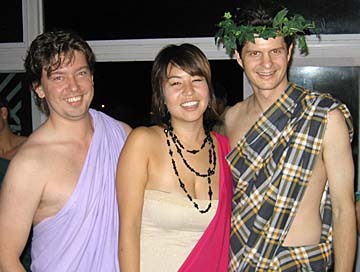 McGuire and her boyfriend, Tim McDevitt, wanted all their guests to participate in the toga experience so they had a colorful selection of togas on hand for those who arrived in 21st century attire -- and a brand new black sheet as a toga for this columnist. 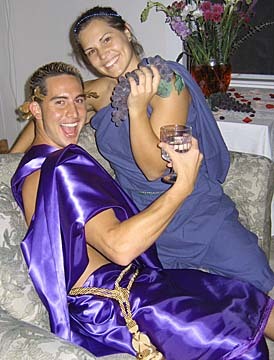 LIVING THE ROMAN LIFE: Likokalehua Miura and Katie Burman arrived at the party separately but made a great couple in matching purple togas as she pretended to feed him a bunch of decorative grapes. Miura explained afterward that his gold laurel leaf wreath was inspired by the story of the doomed love of Apollo for Daphne. She asked the gods to turn her into a laurel tree, and so he wore a laurel leaf wreath in memory of his lost love. REMEMBER HIS NAME: Kip Wilborn, fourth from left, enjoyed the party with Anne Kaltenbach, left, Michael Caliri, Rujunko Pugh, Agnes Martelet and Bertrand Baud. Caliri, visiting from New Orleans, accessorized his toga with several strands of Mardi Gras beads. Wilborn takes the stage in Hawaii Opera Theatre's production of "Il Trittico: The Trio" on Feb. 24. 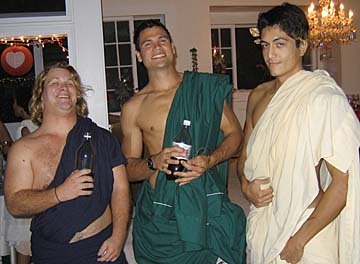 THE TOGA DONE HAWAIIAN STYLE: Andy Johnson, left, Hayden Rayler and Brent "Slydell" Paul came ready to party. 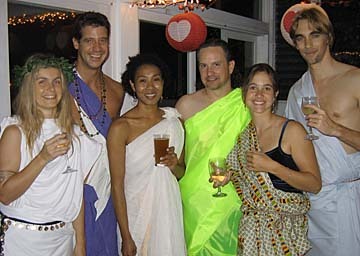 Paul added a patrician aura to his attire with a gold laurel leaf wreath, Johnson went for the casual look, and Rayler tied his toga to suggest a definite Hawaiian influence. JEFF TRIES A TOGA: Jeff Peterson, right, gave Sara Chesney a ride to the party after they finished work at Michel's. Peterson said that he chose the plaid toga because he has some Scots ancestors several generations back. Swavek Locke, left, also went along with the designated dress code.